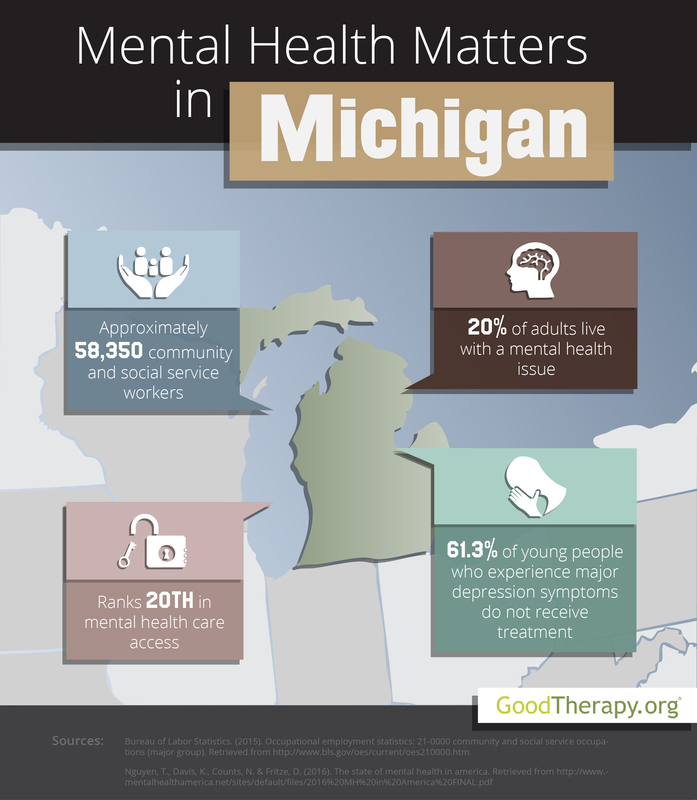 Find a therapist in Michigan with GoodTherapy.org. Estimates from the United States Census Bureau indicate Michigan had a population of about 9.9 million people in 2015. Approximately 50.9% of all residents were female. Minors accounted for 22.4% of the population, while 15.4% were age 65 or older. In 2015, roughly 648,273 veterans lived in Michigan. According to reports from the Bureau of Labor Statistics (BLS), 58,350 residents were employed in jobs that specialized in community and social service activities. These jobs included working at residential treatment centers, outpatient care centers, hospitals, correctional facilities, rehabilitation centers, clinics, community centers, depression treatment centers, schools, and religious institutions. According to the BLS, people in these fields earned an annual average salary of $45,290. In 2016, Mental Health America (MHA) ranked Michigan overall rank at 32nd—when compared to other U.S. states and the District of Columbia—for its mid-range mental health standards, practices, and resources. Michigan was 39th in adult ranking, 25th in youth ranking, 42nd in the rate of experienced adverse mental health conditions, and 20th in access to mental and behavioral health services. According to the 2016 MHA survey, roughly 20% of the adult population in Michigan experiences mental health issues. It ranked a low 42nd in this measure. Additionally, 9.1% of adults have concerns with alcohol or drug dependence, and 4.5% of adults have seriously thought about suicide. The state was 31st and 47th in these categories. Approximately 16.8% of people who live in Michigan and who have mental health issues are uninsured. Therapists in Michigan have also identified issues that may affect the younger population. Data from the Substance Abuse and Mental Health Services Administration (SAMHSA) indicates in 2012-2013, Michigan’s percentages of illicit drug use among teenagers, cigarette use among teenagers, and binge alcohol use among those aged 12-20 were all above the national average, which is 14.7%. The 2016 MHA survey gave Michigan a mid-range rank of 28th for youth dependence on drugs or alcohol. Therapy has proven to be very effective for adults, teenagers, and young children with mental, emotional, and behavioral issues. There are a variety of mental health care providers—including counselors, psychiatrists, marriage and family therapists, licensed clinical social workers, mental health nurses and child psychologists—in Michigan who are able to provide professional assistance. Individuals with adverse issues are encouraged to find a therapist and receive the care they need in order to live a healthier and happier life.